Not only is this a beautiful place, but not many come here. It is isolated enough that the fishing pressure is light, so you can always count on catching a few, enough to have a good feast around the fire at night. It's just on the limit of alpine splendor, which is why I have always liked it. 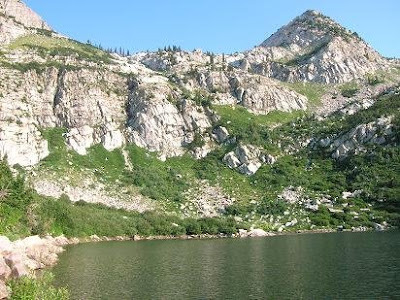 And the long history of American Fork Canyon has always fascinated me, which is another reason I kept going back there so many times. There are some good hikes and 4wd or ATV trails above here. Be careful, though. Not maintained, any more. Some of them are washouts. Some are dead ends. Some are just plain dead drops a thousand feet to no where. One day, soon after I bought my brand new 4runner, I was having the time of my life following old mining roads above silver flats high in the mountains. The trails were a thrill because many of them were so very steep, I could not see the ground of the downhill side of the mogul past the end of the hood. Looking out the windshield, all I could see was empty space in front of me. Then, the front end would roll over the hump and down, and I could see down the next hill. This was very fun, and I was following tire tracks, so I thought it was relatively safe, driving it alone without anyone to spot. Then all of a sudden, I came to what appeared to be another mogul that gave me a very funny feeling. I stopped well short, and walked up to the top to look over. It was not another mogul at all! I was standing atop a tailings dump, that emptied down a sheer cliff! At least 1000 feet below me were the ruins of an old pickup truck and assorted other old machinery long since abandoned and tossed over the precipice. If I had followed the leading wheel tracks a few more feet, afraid my momentum would have carried me over that ledge. Am I better off today? I am not so sure, but I am mighty relieved that my trusty 4runner was not hurt! I'm glad you weren't hurt. I like your 4 runner, and I do think it saved my life last week, but I like you more. After watching Utah peple 4wd and run their ATVs, I am surprised any of them are still alive. Please, let's take a few minutes for some simple lessons. I learned most everything the hard way, That doesn't mean you guys have to. It's not a macho thing! 4wd has some really different stuff that you need to know how to use right, or its not that much help. Don't watch Utah 4wd guys. Most of them are either reckless brains-in-their-gonads or helpless wimps who shoulda stayed on pavement. Don't be like either when you get on the dirt. I'm wimpy and very tentative. That's why it's so bizarre that I rolled. I drive my van more recklessly than I drove your truck, because the first think I noted upon driving the 4 runner was that it was top heavy. I was being so careful! Oh well. Careful doesn't always matter. Miracles IIX: Doctors Let Me In The Door!